There are many great movies that have been based on classic novels. 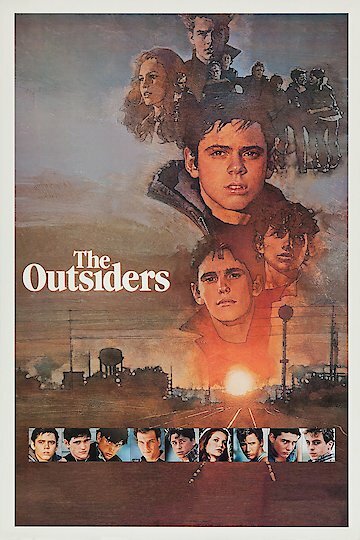 The movie the Outsiders is based on the book by S.E. Hinton. The story is based on a group of teens call the Greasers. They are tough and from low income families. The Greasers are Ponyboy, Soda, Darry, Johnny, Dally, Two Bit and Steve. The rival gang is knows as the Socs which are the rich kids. The main members this group are Bob and Randy. The Socs attach Ponyboy because he was hitting on one of their girlfriends. During the fight Johnny stab Bob fatally. Fearing the consequences Ponyboy, and Johnny leave the town. They find an abandoned church to hide out in and change their appearances in case someone is looking for them. Dally finds the boys to tell them that they will have help in they are brought to court. While the boys leave to get food and supplies someone sets the church on fire. Hearing that there are children inside Johnny rushes in to save them but gets injured in the process. Dally and Ponyboy also helped him rescue the children. While the boys are praised for their bravery and self less deed there are still in trouble with the law for the death of Bob. Upon their recovery Johnny is charged with manslaughter and Johnny is at risk of being placed in a group home for boys. The two gangs have been fighting with the Greasers beating the Socs. Johnny ends up dying from his injuries. Dally cannot deal with his death. He robs a grocery store and has a gun with him Dally ends up being shot by the police. Ponyboy who is cleared from charges relating to Bob’s death is allowed to stay with the only family he has, his brothers. Ponyboy finds a letter from Johnny stating that saving the lives of the children were worth his own life. At the ends Ponyboy begins writing about his experiences from a report that he is to turn in at school. This is a story about friendship and how it a group of troubled teens find the love of a family in each other. The Outsiders is currently available to watch and stream, download, buy on demand at Amazon Prime, HBO NOW, Amazon, Vudu, Google Play, FandangoNow, iTunes, YouTube VOD online.